For such a diverse city, SF has a surprising scarcity of authentic Thai cuisine beyond the common Pad Thai — real dishes that are simultaneously sweet, salty, and pungent. 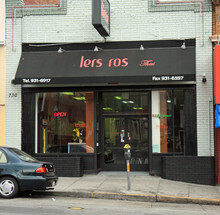 Lers Ros opened in 2008 in the Tenderloin, amidst a stretch of Larkin Stret home to a bevy of Vietnamese and Thai joints and nudie shows, but this Thai gem stands alone. There is nary a Crab Rangoon in sight; just a host of savory and surprising dishes, most of which are less than $8, with flavors that pack so much heat your lips will be tingle. Ordering from the menu of more than 120 soups, salads, noodles, and curries can overwhelm, especially since most dishes sound appealing. Servers are glad to make suggestions, although the language barrier makes this tactic a gamble. 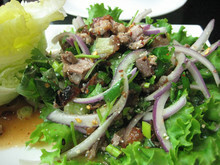 The menu is heavy on meat, but diners who enjoy lighter fare will still appreciate the exquisitely kicky Larb Phed Yang ($8), a salad featuring roast duck, onions, and cilantro tossed with chili, lime, and fish sauce. 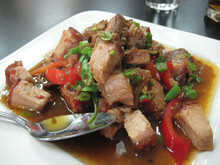 The Pad Kra Prow Moo Krob ($8) is another Lers Ros favorite — basically a giant rich platter of pork belly with thick layers of crisp, crunchy skin. An order of rice creates a convenient excuse to mop up the dish’s savory sauce, especially since Lers Ros is one of the few places in San Francisco to offer the true sticky rice of northern Thailand. Another standout is the Nuer Tod ($7) appetizer: Fried dried beef that tastes like a decadent hybrid of beef jerky and fried chicken. But not all is so consistent. The slim list of daily specials is heavy on exotic meats like alligator and rabbit. The Pad Ped Venison was a colossal $20 disappointment. The fancy meat is unnecessary and totally obscured by peppers and curry. Skip these overpriced novelties and focus your spending power on the regular menu instead. At lunch the dining room is crowded with people dipping into sizzling hot pot soups and a bargain lunch special — two items, rice, and a salad for just $7.25. Thai fans that keep later hours will be overjoyed that Lers Ros is open until 2 a.m. The restaurant also delivers. Service is haphazardly attentive, with dishes arriving at random. The dining room is spare and it’s not uncommon to hear Tupac Shakur’s “California Love” pumping through the sound system while you tuck into your shredded papaya salad. And yet, it’s more than the dicey surroundings that make this fluorescent-lit little dining room an adventure. Lers Ros offers dishes that feel like discoveries at a most welcome price point.